PROVIDENCE, R.I. [Brown University] — Its head and body looked like a dog, yet its striped coat was cat-like. It carried its young in a pouch, like a kangaroo. No wonder the thylacine — the enigmatic, iconic creature of Australia and Tasmania — was the object of so much confusion, alternately called the "marsupial wolf" and the "Tasmanian tiger." "We provide quantitative support to the suspicions of earlier researchers that the thylacine was not a pursuit predator," said Borja Figueirido, a postdoctoral researcher at Brown University and the paper's lead author. "Although there is no doubt that the thylacine diet was similar to that of living wolves, we find no compelling evidence that they hunted similarly." For millions of years, Thylacinus cynocephalus roamed mainland Australia. Its numbers declined as humans settled throughout the continent, beginning some 40,000 years ago, and the dingo, a small, dog-like creature, was introduced, about 4,000 years ago. Thylacines' last remaining outpost was in dingo-free Tasmania, but a concerted eradication effort wiped out the species. The last known thylacine, said to be named "Benjamin," died at a zoo in Hobart in 1936. Researchers debate why the Tasmanian tiger fared so poorly on continental Australia with the arrival of humans and dingoes. Most accept that human activity disrupted thylacine habitat and perhaps its food sources as well. But there is less agreement about the dingoes' effect. The conventional thinking had been that dingoes were the placental spitting image of the marsupial thylacines, evolved in isolated settings, which biologists term evolutionary convergence. When dingoes arrived in Australia, they helped push the thylacines out. Though highly similar in their skull anatomy, specialized for a carnivorous diet, the thylacine, front, and the dingo very likely had different hunting styles. Researchers analyzing skeletons of the forelimbs found important differences. But Figueirido and Christine Janis, professor of biology in the Department of Ecology and Evolutionary Biology and a co-author on the paper, don't think that's the entire story. To make their case, they turned to the thylacine's skeleton and compared it with those of dog-like and cat-like species, from pumas and panthers to jackals and wolves, as well as hyenas and Tasmanian devils, the largest living carnivorous marsupials. They knew from previous research that the elbow joint was a clue to predator habits, as it showed whether the animal was built for flexibility and dexterity in handling prey or for chase and speed in tracking down the next meal. Examining the bones, they found that the thylacine's humerus, or upper arm bone, was oval and elongated at the end closest to the elbow, implying that the animal's forearm bones, the radius and ulna, were separate. That means the Tasmanian tiger would have been able to rotate its arm so that the palm faced upwards, like a cat. The distal humerus on dog-like animals, such as dingoes and wolves, is "more squared-up and shorter," Janis said. This indicates the radius and ulna were closer together in these species, reflecting that these animals' hands are more fixed in the palm-down position. "It's a very subtle thing," said Janis. "You never would think that the shape of just one bone would mean so much." Yet some cats, like cheetahs, use speed to catch their quarry, while some canid species, like foxes, rely more on the guile of the ambush. Janis said the thylacine's hunting tactics appear to be a unique mix. "I don't think there's anything like it around today," she said. "It's sort of like a cat-like fox." What that means for the dingo's role in the thylacine's disappearance from continental Australia is not clear, but it does show the animals, while similar in many respects, likely hunted differently. "Dingoes were more like the final straw [to the Tasmanian tigers' demise in continental Australia]," Janis said, "because they weren't in the same niche. It's not just that a dingo was a placental version of a thylacine." 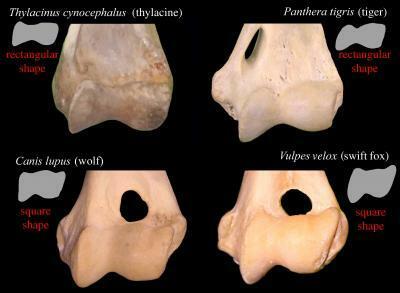 The elbow joint of the thylacine and the modern tiger, top, is wider and more rectangular than the dog-like wolf and fox, bottom, which are more toward the square. This suggests different styles of catching and subduing prey, cat-like or dog-like.